“In this riveting new novel from Michael Hiebert, a killer’s release is the catalyst for shocking revelations in a small Southern town. . .
At twenty-two, Sylvie Carson has known a lifetime’s worth of trouble. When she was a child, her baby brother was shot to death by a man named Preacher Eli. Orphaned by her teens, Sylvie is now raising her own baby with no partner in sight. For all these reasons, Leah Teal, Alvin, Alabama’s only detective, tries to stay patient when Sylvie calls the station day and night, always with some new false alarm. But now Preacher Eli is out of prison and moving back to town. As far as the law is concerned, the old man has paid his dues–though Leah’s twelve-year-old son, Abe, vehemently disagrees. Between that and his relentless curiosity about the daddy he hardly knew, Abe’s imagination is running in all directions lately. While Leah struggles with how much of the past to reveal to Abe, she’s also concerned about Sylvie’s mounting panic. Something in her gut tells her the girl might be a target after all. For as Leah knows well, there’s danger not just in the secrets others keep from us, but in the lies that corrupt from within. It’s a hunch that will be tested soon enough, as tensions mount on both sides. 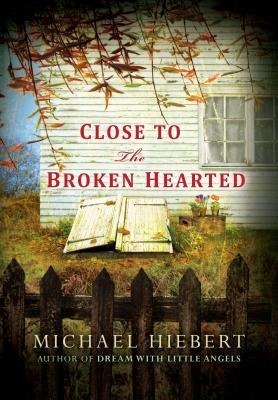 Close to the Broken Hearted by Michael Hiebert is the second novel in a series set in 1985 Alvin, Alabama. Partially narrated by twelve-year-old Abe Teal, the rest of the novel gives us the third-person view of Abe’s mother, Detective Leah Teal, and a third character, 22-year-old Sylvie Carson. Sylvie is a very troubled young woman, suffering from anxiety and paranoia from the age of five, when she witnessed the murder of her three-year-old brother. Her mother was murdered, as well, when Sylvie was twelve, and her father committed suicide a few short years later. She has been on her own ever since and is now the single mother of a 3-month-old baby girl. Leah Teal finds herself more and more the only member of the Alvin police force willing to humor Sylvie’s frequent calls for assistance, which, as a rule, are false alarms… until they’re not. Soon Sylvie’s calls have a truth behind them that was never there before – a poisoned cat, open cellar doors, things moved around in her home. Sylvie is convinced this is the work of Preacher Eli, the recently paroled man who shot her little brother eighteen years ago. Leah is not so sure – but if not Eli, then who could it be? Tensions rise as Sylvie continues to be a target – and as Preacher Eli starts to look not so innocent after all. This is definitely a novel written about the stereotypical South. There is much droppin’ of the last letters of words, an’ lots of reckonin’ goin’ on, an’ plenty of ain’t-bombs scattered willy-nilly. Frankly, it’s almost a little too much. The mystery side of things is almost secondary to the daily life of Abe and his family (mother Leah and sister, Carry) so there’s not a whole lot of suspense or drama there. Abe Teal, however, saves the day. Twelve-year-old Abe and his friend Dewey wander about Alvin, experiencing life and getting in and out of scrapes with Abe’s mother; most of these caused by Abe’s rampant curiosity. He spies on suspicious townfolk. He ponders life and the many quandaries that come along with it. He thinks a lot about racism, and how to do the right thing. He is loveable and wise beyond his years. While I did enjoy this novel, it was not the fabulous experience I had hoped for. Again, I really just felt that the Southern stereotypes were both too strong and too simple at the same time. I felt the storyline was not fleshed out quite enough. Despite these things, however, Close to the Broken Hearted was a nice, light read that I did have a pleasant time reading during a day with many interruptions; it was very easy to stop and start without losing my way in the story. This is the perfect novel for someone who wants a little mystery, a little bit of South, a lot of heart – but not too much meat. If that’s you, pick it up today! Close to the Broken Hearted by Michael Hiebert will be in stores on June 26, 2014. Buy it, read it, love it.